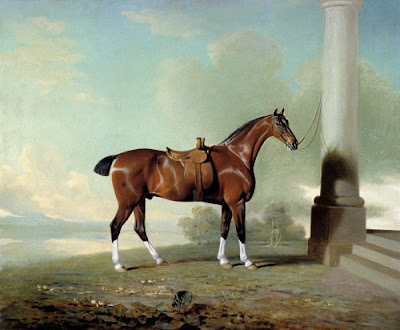 I recently became reacquainted with the British painting mania for horse portraits and hunting scenes that flowered between the late 1600s (in both Holland and Britain) and early 1800s. In the 1700s, this fad became so widespread among those with lots o’ money (who could afford to own a horse and go hunting), that a whole school of “horse and sporting” painters developed in Britain. George Stubbs (1724–1806) was the king of the horse painters, and published a book in 1758 on horse anatomy that is still referenced today, “The Anatomy of the Horse.” This whole genre is really an example of how the horse has been idolized throughout the history of humankind, since they were referenced in cave painting over 35,000 years ago. I can’t think of any animal that has served humankind in so many vital capacities as the horse. Truly, after the dog, human’s best friend! The “animal and sporting” painters did not limit their work to animals, but were also skilled portrait painters of people. Most often the people portraits were part of the portrait of their most cherished horse or hunting dogs. In Britain, the cultivation of fine horses was definitely an upper-class pursuit, so that horse portraits such as Favorite Hunter of Lady Frances Stephen were obviously status symbols. One has to admire the fidelity to the textures of the horse’s hair accentuating the musculature accurately, and the noble air Benjamin Marshall’s portrait has given the horse. Marshall was a student of Stubbs. Since the demand for horse portraits was so great, Marshall concentrated on animals as a large part of his body of work, both painted and engraved. Another aspect of the horse and sporting paintings was portraits of race horses, often with their owners. Marshall spent most of his career living in Newmarket, London, near a race track. Because American painting was heavily influenced by British painting during our early history, horse portraits became a moderately popular genre in the US as well. 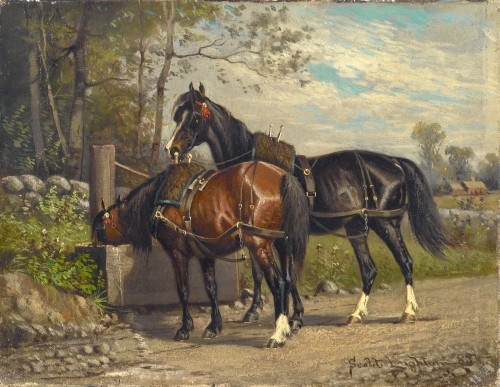 However, American horses were usually working horses from farms that had won county fair competitions, rather than pampered horses reserved for hunting or racing. 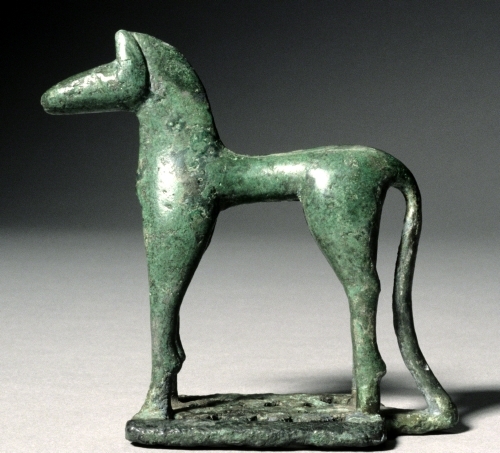 As in Britain, horses in ancient Greece represented wealth. Good pasture was expensive and very little money came from the government for their upkeep in time of war when they were used in the cavalry. They were used essentially for upper-class pastimes such as hunting and racing. Horseracing was such a big sport that it was incorporated into ancient Olympic games. Another major source of the love of horses came from religious stories of the gods traveling in chariots and of course from the famous winged horse Pegasus. Praises of the gods’ virtues always included their excellent horse skills. It was a common practice for people to make offerings at temples of small votive figures of horses such as this. Throughout China's long history, no animal has played such a significant role in both society and art as the horse. Since its domestication about 5000 years ago, it became a vital way with which the Chinese defended and extended their kingdom. During the Shang Dynasty (ca. 1528–1028 bce), horses and their vehicles were buried with their owners to serve them in the afterlife. The Western Zhou period (1027–771 bce) measured military strength by the number of chariots available to a kingdom. During the Han Dynasty (206 bce–220 ce), the Chinese spent vast sums of money to import better quality horse from the West. During the Tang Dynasty (618–907 ce), horses were improved with better breeding practices, and through the importation of Arabic-style horses from the Middle East. From the Zhou Dynasty (1027–256 bce) through the Song Dynasty (960–1279 ce), the human and horse sacrifices were replaced by ceramic figures such as this glazed earthenware piece, as well as figures of familiar human attendants. 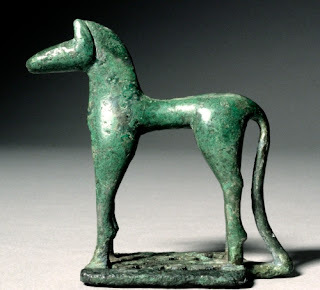 The Han and Tang Dynasties are most renowned for the tomb figures of horses. The horse, like the dragon, was also an important religious symbol for the Chinese. Like the dragon, horses were thought to be able to fly. They were believed to be able, like the dragon, to carry the deceased to the home of the immortals (the afterlife). Butterfield is renowned for her remarkably intuitive depiction of horses in a variety of found objects, and in found objects that are cast into more durable metal parts. She was born the same day as the Kentucky Derby, and attributes that auspicious birth date with her affinity for horses and the horse as subject matter. Although early on she had thought of studying to be a veterinarian, she instead decided to study sculpture. The horse became her primary theme from the very beginning of her career in the 1970s. She alternates her time between a horse ranch in Bozeman, MT and a studio in Hawaii. 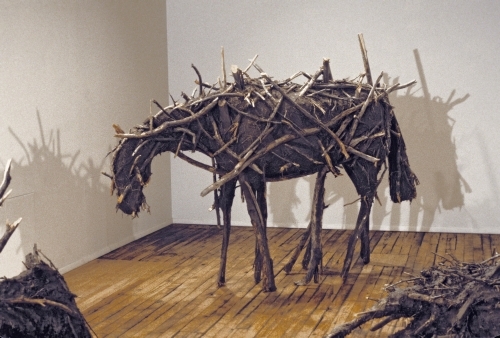 Butterfield does not make sketches for her horse sculptures, but rather “draws” the outlines of the animal with her found objects. She prefers to portray horses at rest rather than in motion, because she feels that at rest the gesture or movement are contained within her forms due to the materials she uses. Some recent works are constructed of metal casts of tree branches. 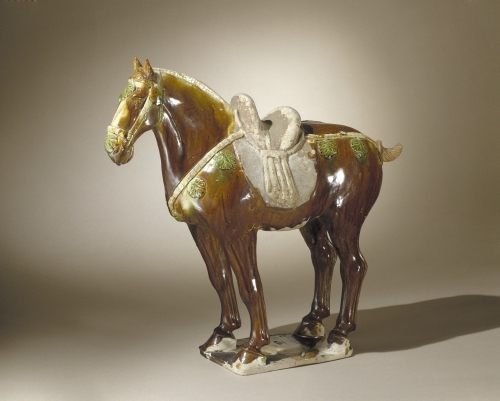 Butterfield’s sculptures capture the essence of horses as faithfully as do Marshall’s paintings.